April on Sale! February 2020 Available! Private SALTWATER HEATED Pool! EXECUTIVE TOWNHOUSE WITH PRIVATE SALTWATER HEATED POOL - JUST STEPS FROM THE BEAUTIFUL BEACHES OF COCOA BEACH!!! FIVE BLOCKS NORTH OF COCOA BEACH PIER!!! 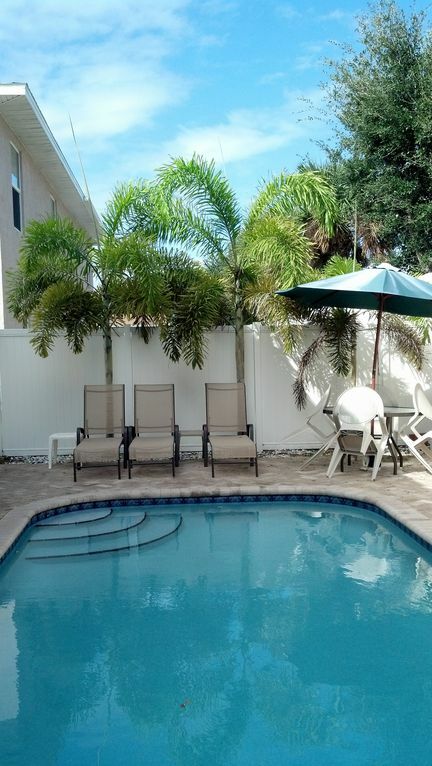 This property is licensed with the State of Florida to operate as a vacation rental. If you stay somewhere else, make sure the property is licensed or your trip may be cancelled unexpectedly! Much better than renting a condo!! This is like having a private oasis! The saltwater heated pool is better for your hair, skin and bathing suits - no harsh chemicals! Our newly installed gas heater will keep the pool water comfortable for swimming in all seasons! The rooms are spacious and the windows are large! All bedrooms located on second floor. Rent this executive townhouse for families and friends, or business. Sleeps 10-12 comfortably. Private SALTWATER pool with paver patio and tropical landscaping. All of the furniture is modern and comfortable. Dining table seats 6 and kitchen island seats 4. Check-in is 3 pm; check-out is 10 am. Need references? Please see all the wonderful comments our guests have left for us - click on the 'comments' link below! This property is located just one half block from the beach, minutes from dining, shopping, golf, tennis, world famous Cocoa Beach surfing & surf camps, Port Canaveral fishing, gambling boats, cruise lines. 45 minutes or less from Disney World, Sea World, Kennedy Space Center, Bush Gardens, Brevard Zoo, Islands of Adventure, Universal Studios, Water Parks, horseback riding, Enchanted Forest, Wildlife Refuges, airboat rides, freshwater fishing. Native Floridian, born and raised in Brevard County now living in Central America. Cocoa Beach is a great place to vacation and this property boasts a private SALTWATER pool! The property is also centrally located to so many activities, you rarely need to drive anywhere if you don't want to! Close to quiet beach with great surf break, lots of local activities and this property has a private saltwater pool! Linens, Towels and Beach towels provided! Dedicated wireless connection for the rental unit. Shuffleboard & Bridge available at Recreation Center, Gambling Cruises, nature tours, airboat tours, stand-up paddle tours, boat rentals/tours, fishing charters, parasailing, dolphin/manatee tours.